I wish I could say I found some magic key that opened up my heart and mind to my higher self. Nope. Instead I am sitting here with a headache and frustrated at my art. We definitely trick ourselves into thinking we are worthless. Even when we take on the world everyday. In my opinion humans are placed in such a way that unless our emotions are fighting a cause or they are made up of sunshine and kittens, they are tragically vain. Dramatically vain. How dare you have personal emotions that are sad, mad, frustrated, manic for NO REASON. I assure you, they are for reasons. They may just not be reasons that you care to hear. Or, that seem trivial. Maybe they are trivial. Maybe you do not have time for them because you have your own trivial reasons for emotions. Why is it that if I show you I am human, you are turned off by this? Why is what I am going through not as important as what YOU are going through? We will say we have empathy and compassion for others, but do we really? Do we teach that to our children? Okay, so what about for ourselves? Do we forgive our shortcomings? Why can't I look myself in the mirror after a storm of tears and flailing bouts of anger and tell myself..."I am here for you". Instead its "quit crying you big baby" or "now can't we be more positive?" What if I just want to feel human and be okay with that? What if I betray myself? Growing up, I moved around a lot. It never got easier. They say that children are resilient. I was very resilient. I had to be. I got picked on all the time. Children are resilient because they are vulnerable. I used my vulnerability as a way to survive. Mostly to seek out anyone who would acknowledge that I existed. Someone to feel bad about my situation. Seeking sympathy becomes toxic. However, sharing my story did save me as well. I have met so many wonderful people. And some not so good. Anyone who knows me, knows that I am emotional. Apologetically. I find myself trapped by these emotions often and it blocks me as a creative person. I do in fact, feel weak. I feel SHAME. The very thing I am trying to fight. I get stuck in the loop. I have let myself get close to others even when it has broken me. I also have let down others who have been vulnerable to me. Yet, I still believe this is the only authentic way we connect as humans. To allow ourselves to feel and express emotions even when it is scary. Even if we know it could hurt us or we could hurt someone. If we close ourselves off from emotion, then we are no longer human. 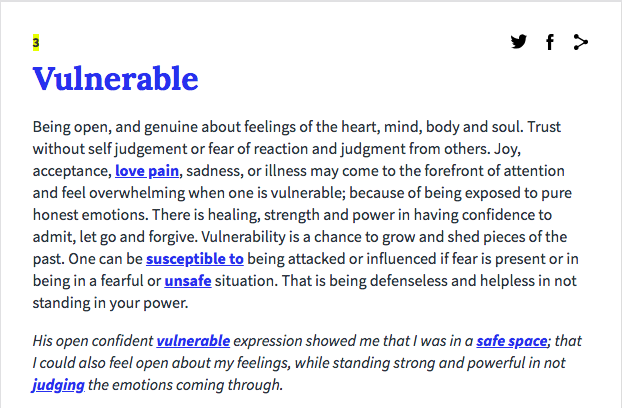 The Webster definition of vulnerability is "the state of being exposed to the possibility of being attacked or harmed, either physically or emotionally." That sounds TERRIFYING. No wonder everyone is so guarded. I am not sure who wrote this but THAT is exactly the kind of vulnerability that we need with one another. I do not seek sympathy in my adult life. I do wish to give and receive understanding, compassion and genuine connection. Researcher and Story teller Brene Brown says "Vulnerability sounds like truth and feels like courage. Truth and courage aren't always comfortable, but they're never weakness." I have been broken a million times but I am trying to remain open. For that I am proud of myself.